Diamond Jim’s has been restoring and maintaining decks since 1995. We are known industry wide as the wood care experts and are often called in to solve problems caused by bad finishes. We have been interviewed by Cleaner Times magazine for their issue on exotic wood care. We know how important a deck is for your home. From using them for family cook-outs, lounging and as a way to extend your indoor living area to the outside, decks are an asset that adds value to your Connecticut home. We take care of all decks, large or small, whether your deck is made of mahogany, cedar, ipé, cambara or pressure treated lumber. Your deck may have turned gray, mildewed and warped, it may be splintering on the handrails and decking boards. You may think that it has been neglected to the point that replacement is the only option. Oftentimes however, many of these decks can be saved, restored and used for many more years to come. We have restored decks that were 20 years old and now 15 years later they are still in beautiful shape. If your deck does not have a finish on it, or has a finish that will come off with cleaning, then it simply needs to be cleaned properly before we oil it. We start the process by pressure cleaning to remove the dirt and film that comes on new wood. This process prepares the wood for the oiling. We wait around 48 hours for drying time or till the wood has a 12% moisture content. If the wood is not dry enough finishes applied will fail. Two coats of a sealing oil are then applied until the wood reaches it’s saturation level. I offer several colors to choose from. It is recommended that a color stain be chosen to protect your deck from ultraviolet light damage which promotes premature graying of the wood. Stains that are applied do lighten within two weeks so please take this into consideration when making your color choice. If you do choose a clear oil, your wood will gray over time again as there is no UV protection in clear oil. If your deck has film forming finishes on it, then it may have to be stripped. You can view our page on paint stripping here. We also created a visual guide to paint stripping to give you a step-by-step look at the process. View our completed jobs in our Deck Envy Portfolio. This is a great place to see different color oil finishes as well. Diamond Jim’s Deck Maintenance Program. 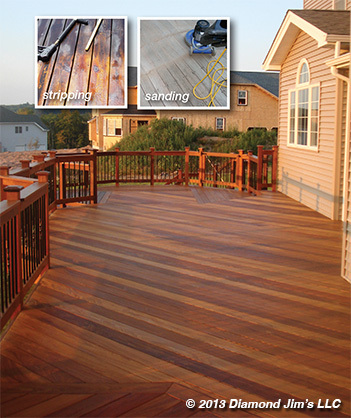 We have developed a deck maintenance program to keep your wood in prime condition. The floor of a deck gets very dirty from yard care, pollen, spills, grilling and foot traffic. After the initial treatment of your deck Diamond Jim’s offers a yearly program to prolong the wood’s life and good looks by pressure cleaning the surface and applying a light coat of oil. Moisturizing your deck once a year will keep common problems like cupping and splitting of the wood away. We recommend doing horizontal areas like floors every year and vertical areas like posts every third to forth year. A little maintenance every year will keep your deck looking new and prevent higher costs later. Water-repellent preservative finishes are the easiest to maintain, they are the only finish that will enhance the integrity of the wood by supplying essential oils that keep the sun, rain, and time from damaging your deck. Oils penetrate into your deck stopping the water from absorbing into the boards, this prevents splitting, cracking, warping and cupping of the boards. Oil preservatives will enhance the grain of the wood. A film forming finish is a flat color, whereas a deck that has been oiled shows off it’s assets. Why cover up the very reason you chose your wood for. Penetrating oil finishes do not need to be stripped. You will never have that flaking, cracking and chipping associated with a film forming finish. Film-forming finishes are unsuitable for use on wood decks. They trap in moisture through water getting in the cracks. The water trapped by the paint film will lead to decay and mold. The film forming finish will then peel. Film forming finishes are extremely hard to maintain. People will keep applying new coats every year or so, but the moisture and mold continue to be under the old layers of paint. Mold can actually grow through the film forming finishes. If you are in need of deck cleaning services in Connecticut, call us today at 203-558-0968 or complete our online form.